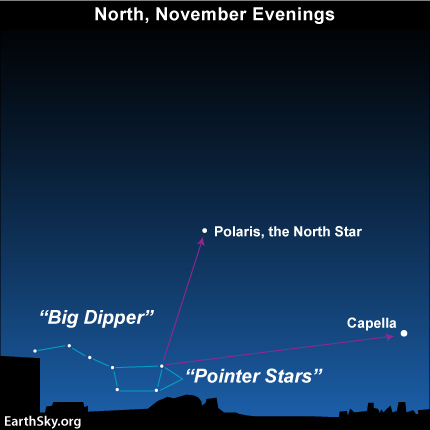 You can use the Big Dipper to find the brilliant star Capella in the constellation Auriga the Charioteer. The top two bowl stars point toward Capella, as we depict on today’s sky chart. The phrase spring up and fall down gives you some idea of the Big Dipper’s place in the evening sky. On fall evenings, the Big Dipper sits way down low in the northern sky. On spring evenings, the Big Dipper shines high above Polaris, the North Star. In the far southern U.S., you won’t see the Big Dipper on these November evenings, because it’ll be beneath your northern horizon. Even in the northern states, it’ll possible to miss the Big Dipper if obstructions block your view of the northern sky. 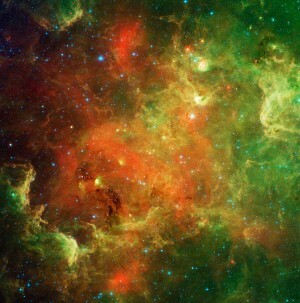 However, the Big Dipper swings full circle around Polaris, the North Star, once a day. The Big Dipper will appear fairly high in the northeast sky before dawn. It’s a long jump from the Big Dipper bowl stars to Capella. Our chart goes all the way from northeast to northwest. That’s about one-fourth the way around the horizon. Although the Big Dipper and Capella move throughout the night, the Big Dipper bowl stars always point in the general direction of Capella, the northernmost first-magnitude star in all the heavens.